Identifying the ‘stuff’ you discover on Sanibel can be overwhelming. There is a staggering abundance of native flora and fauna, and then there’s what is on the beach. Not a single day since moving to Sanibel, have I walked the beach and come home without a new treasure to identify. There are many good ID guides available, but two stand out for me. The first resource I turn to is not a book at all, but an amazing blog. iLoveShelling is a comprehensive and well organized blog, crafted by longtime Sanibel resident Pam Rambo, which chronicles the island’s common (and not so common) sea shells, beach bling, flora and fauna. Pam is an artist, photographer and lover of all things ‘seashell’ and ‘beach bling’. She shares in stories, photographs and videos what she, and other folks, are finding on Sanibel’s beaches. Her creativity and love for life on Sanibel shine through every post and photograph. Even if you aren’t a sheller it’s worth a visit to her blog. Her posts will transport you to our little paradise here in SW Florida. 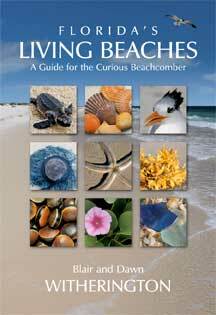 If I’m in the mood to peruse an ID book, Florida’s Living Beaches is most used in my home. Purchased in January 2012, it is already dog-eared from use. Many shops on Sanibel have copies for sale. I found mine at MacIntosh Books and Paper.